This book is being written at a time when fundamental shifts in thinking are occurring in the life sciences, but when the metaphorical ground has not yet settled under our feet. There are no germ-free animals in nature. Epithelia in contact with the environment are colonized by microbial communities, and all multicellular organisms must be considered an association of the macroscopic host in synergistic interdependence with bacteria, archaea, fungi, and numerous other microbial and eukaryotic species. 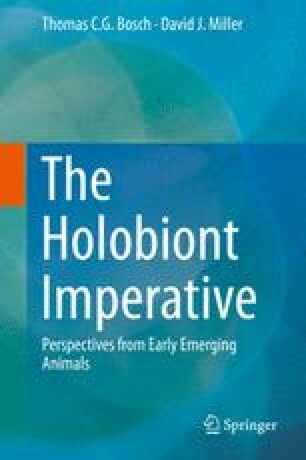 We refer to these associations that can be analyzed, measured, and sequenced, as “holobionts” or “metaorganisms” (Fig. 1.1).